News now from Noyan Mutlugil at Mutlutur Yachting as he tells me of a €150,000 price drop on the 30.4m tri-deck motor yacht Dream Yacht. Custom built to RINA class in 2005 by Shama Yachts, her expansive interior accommodates 10 guests in five staterooms including a split-level owners' suite on the main deck. Twin 1,500hp engines give her a maximum speed of 18 knots and Noyan says she’s priced for a quick sale. 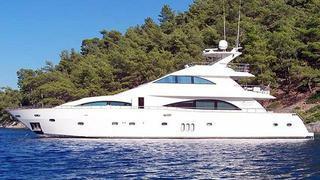 Located at the Marin Didim Marina in Turkey, Dream Yacht is now asking €1,350,000.